Europe bank's exposure to the eurozone debt crisis has increased to €300bn (£263bn). The epicenter of sovereign risk has been Greece, which generated the first of four waves of spillover to European banks. The analysis suggests that, first, spillovers on European bank exposures to the Greek sovereign have amounted to almost €60 billion (Figure 1.17). Second, as sovereign risks spread to other governments, the spillovers to banks have mounted. 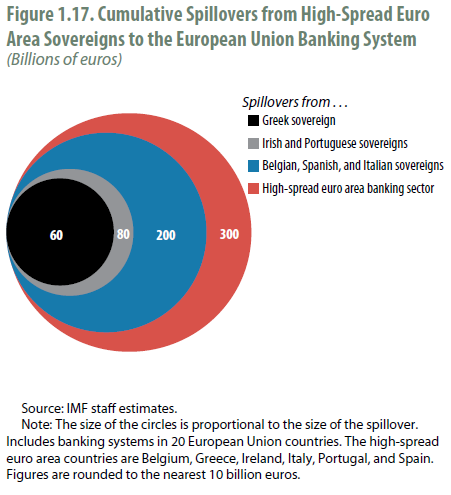 If the sovereign stresses in Ireland and Portugal are included, the total spillover rises to €80 billion. Third, the governments in Belgium, Italy, and Spain have also come under market pressure; incorporating credit risks from these sovereigns into the analysis further raises the total estimated spillover, to about €200 billion. Fourth, bank asset prices in the high-spread euro area have fallen in concert with sovereign stresses, leading to a rise in the credit risk of interbank exposures; including those exposures increases the total estimated spillover to €300 billion overall. Although these numbers are based on market assessments of credit risk, which may reflect a degree of overshooting, the underlying problems that they highlight are real. It estimated that the eurozone debt crisis has directly cost banks in the European Union €200bn since Greece's debt crisis erupted. Of this, €60bn comes from sovereign debt in Greece, €20bn from Ireland and Portugal, and €120bn from Belgium, Spain and Italy. The IMF estimated that there was a further €100bn in additional costs linked to the banks of those six countries. Financial stability risks have increased substantially over the past few months. Weaker growth prospects adversely affect both public and private balance sheets and heighten the challenge of coping with heavy debt burdens. Public balance sheets in many advanced economies are highly vulnerable to rising financing costs, in part owing to the transfer of private risk to the public sector. Strained public finances force policymakers to exercise particular care in the use of fiscal policy to support economic activity, while monetary policy has only limited room to provide additional stimulus. Against this backdrop, the crisis—now in its fifth year—has moved into a new, more political phase. In the euro area, important steps have been taken to address current problems, but political differences within economies undergoing adjustment and among economies providing support have impeded achievement of a lasting solution. Meanwhile, the United States is faced with growing doubts over the ability of the political process to achieve a necessary consensus regarding medium-term fiscal adjustment, which is critically important for global stability. As political leaders in these advanced economies have not yet commanded broad political support for sufficiently strengthening macro-financial stability and for implementing growth-enhancing reforms, markets have begun to question their ability to take needed actions. This environment of financial and political weakness elevates concerns about default risk and demands a coherent strategy to address contagion and strengthen financial systems. Indeed, a series of shocks have recently buffeted the global financial system: fresh market turbulence emanating from the euro area periphery, the credit downgrade of the United States, and signs of an economic slowdown. In the euro area, sovereign pressures threaten to reignite an adverse feedback loop between the banking system and the real economy. The euro area sovereign credit strain from high-spread countries is estimated to have had a direct impact of about €200 billion on banks in the European Union since the outbreak of the sovereign debt crisis in 2010. This estimate does not measure the capital needs of banks, which would require a full assessment of bank balance sheets and income positions. Rather, it seeks to approximate the increase in sovereign credit risk experienced by banks over the past two years. These effects are amplified through the network of highly interconnected and leveraged financial institutions; when including interbank exposures to the same countries, the size of spillovers increases by about one half. Banks in some economies have already lost access to private funding markets. This raises the risk of more severe deleveraging, credit contraction, and economic drag unless adequate actions are taken to deal with the sources of sovereign risk—through credible fiscal consolidation strategies—and to address the potential consequences for the financial system—through enhancing the robustness of banks. This Global Financial Stability Report cautions that low policy rates, although necessary under current conditions, can carry longer-term threats to financial stability. With growth remaining sluggish in the advanced economies, low rates are appropriate as a natural policy response to weak economic activity. Nevertheless, in many advanced economies some sectors are still trapped in the repair-and-recovery phase of the credit cycle because balance sheet repair has been incomplete, while a search for yield is pushing some other segments to become more leveraged and hence vulnerable again. Moreover, low rates are diverting credit creation into more opaque channels, such as the shadow banking system. These conditions increase the potential for a sharper and more powerful turn in the credit cycle, risking greater deterioration in asset quality in the event of new shocks. Stepped-up balance sheet repair and appropriate macroprudential policies can help contain these risks. Emerging market economies are at a more advanced phase in the credit cycle. Brighter growth prospects and stronger fundamentals, combined with low interest rates in advanced economies, have been attracting capital inflows. These flows have helped to fuel expansions in domestic liquidity and credit, boosting balance sheet leverage and asset prices. Especially where domestic policies are loose, the result could be overheating pressures, a gradual buildup of financial imbalances, and a deterioration in credit quality, as nonperforming loans are projected to increase significantly in some regions. At the same time, emerging markets face the risk of sharp reversals prompted by weaker global growth, sudden capital outflows, or a rise in funding costs that could weaken domestic banks. This report finds that the capital adequacy of banks in emerging markets could be reduced by up to 6 percentage points in a severe scenario combining several shocks. Banks in Latin America are more vulnerable to terms-of-trade shocks, while banks in Asia and emerging Europe are more sensitive to increases in funding costs. area. However, it is paramount to ensure swift implementation of the agreed steps and to consider further enhancements in the economic and financial governance framework of the euro area. The United States and Japan must address sovereign risk through strategies that consolidate fiscal policy over the medium term, particularly given the many adverse global economic and financial repercussions that would follow from failure to adequately deal with U.S. fiscal problems. Credible efforts are required to strengthen the resilience of the financial system and guard against excesses. Appropriate fiscal action, combined with measures to strengthen banks through balance sheet repair and adequate capital buffers, can help break the link between sovereign risk and banks. If a country’s fiscal measures are successful in restoring the long-term sustainability of its public finances, its sovereign risk premium will come down, and this will reduce pressures on banks. Nevertheless, in view of the heightened risks and uncertainties—and the need to convince markets—some banks, especially those heavily reliant on wholesale funding and exposed to riskier public debt, may also need more capital. Additionally, the amount of new capital needed would also depend, in part, on the credibility of the macroeconomic policies pursued to address the roots of sovereign risk. Building capital buffers would also help support lending to the private sector. Weak banks would have to be either restructured or resolved. Any capital needs should be covered from private sources wherever possible, but in some cases public injections may be necessary and appropriate for viable banks. Stronger macroprudential measures may be required to contain risks associated with a prolonged period of low interest rates and credit cycle risks. Emerging market policymakers need to guard against overheating and a buildup of financial imbalances through adequate macroeconomic and financial policies. Stress tests show that there is a case for further strengthening bank balance sheets across many emerging markets. The financial reform agenda needs to be completed as soon as possible and implemented internationally in a consistent manner. This includes the finalization of Basel III, the treatment of systemically important financial institutions, and addressing the challenges posed by the shadow banking sector. looks at the forces driving the global asset allocations of long-term, real-money institutional investors and the potentially lasting effects of the crisis on their investment behavior. Public and private pension funds, insurance companies, and the asset managers who assist them are found to have altered their behavior during the crisis by pulling away from risky, illiquid assets. The chapter cautions that the generalized move to safer, more liquid securities may limit the stabilizing role that long-horizon investors can play in global markets. The chapter finds an acceleration of the longterm trend toward emerging market assets. The main determinants are strong prospects for domestic economic growth and lower perceived country risk rather than interest rate differentials. prevent destabilizing cycles. Interestingly, the ability of countercyclical capital requirements to mitigate systemic risk is unaffected by exchange rate regimes. This suggests that such a tool may be widely effective across a number of different types of economies. Overall, the chapter takes a step forward in the design and operation of macroprudential frameworks—a topic under intense discussion in many countries following the crisis.